Persian classical music is based on improvisation and composition, and it is interwoven with Persian poetry. The repertoire of this music consists of several hundred short melodic movements called gusheh. Each gusheh has a unique character, feeling, and history to it, which has been passed on orally from generation to generation. In A Musical Journey through Iran, Taghi Amjadi on vocals, Sina Dehghani on tonbak, and Amir Nojan on setar aim to use the universal language of music to communicate and share the feelings of these melodies with the Freight audience. 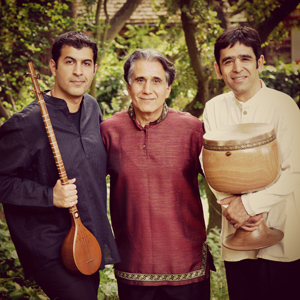 Taghi Amjadi grew up in Iran, where he studied with master musician Esmail Mehrtaash, and continued his studies in the Bay Area with Mahmoud Zofonoun and visiting artists Mohammad R. Lotfi and Mohammad R. Shajarian, who helped him broaden his understanding of the ancient art of classical Persian singing. He currently teaches classical Persian singing at the Shiraz Arts Academy in San Jose and works as a psychotherapist privately in the Bay Area and at San Francisco State University. Sina Dehghani was born in 1976 in Tehran. At 14, he began playing two ancient Persian percussion instruments, tombak and daf, and studied with Bahram Dehghani, Majid Hesabi, and Navid Afghah. He currently lives in Sacramento, and teaches and performs throughout the United States. Amir Nojan was born in Shiraz, Iran in 1980, where he studied setar, a Persian instrument similar to the lute, with such masters as Dariush Talaei, Jalal Zolfonoon, and Mohammad Lotfi. In 1998, he founded the Nava Ensemble, and since then he has performed many concerts in Iran, Europe, and America as a composer, soloist, improviser, and ensemble player. In 2012, he founded the Shiraz Arts Academy for the teaching of Persian music and arts.